One of the best things about living in Florida is the abundance of plants and wildlife. One of the reasons for this is our amazing climate. We rarely get frost in the Central and Southern parts of Florida, and almost never get snow. Even in droughts, we have more rain than a lot of other states. We also have diversity in our climate. We have beach, scrub, wetland, and forested areas all at our fingertips. Florida really is one of those rare places where, with lots of love and perseverance, you can grow anything. That being said, you don't get the perfect garden all by chance. You do still have to put a good bit of work into it. Some plants do better in pots, some plants work better in shade, you have to devote some of your time and effort in to figuring out just how you're going to put your garden together, and how much work you can afford to put into it. One of the first rules with gardening, is that you have an easier time of it when you work with nature and not against it. This means that the easiest garden you can design is one that makes use of mostly native plants. Florida native plants have been tested, by time and nature, and have proven to be highly able to survive in the environment. This means that our native plant species are typically more drought tolerant, pest tolerant, and more hardy. Florida has a host of little climates that all work best with different plants. Find out which one you're located in. Figure out what kind of soil you have, how long the growing season is, how hot it gets, how cold it gets, how much rain do you get, and at what time of year it tends to rain the most. From there, figure out your personal space. Where on your property are you planning on setting aside the space to garden? Do you want to plan a raised bed? Or are you just going to plant in the ground? Do you want to plant in the shade, or full sun? What works best for me is to do a combination of planting in the ground and planting in containers/raised beds. That might not work for you. Do a little soul searching and figure out just where you want to build your garden. Once you have a place for your garden, then you can begin to figure out which plants will fit best. Most people would be surprised at how many beautiful plants are native to their area. People I encounter are constantly surprised at how beautiful some of the plants I find are. And most of these plants are “weeds” and are typically not allowed to grow to their full, beautiful, potential before they are yanked out of the ground. Purslane is a common weed here in Central Florida. Not only is it really easy to grow, it has beautiful flowers, and its a super-nutritious edible! However, many species are endangered so don't just go around grabbing up every wild plant you see. There are some great tools online to help you find the right plant for your Florida garden. 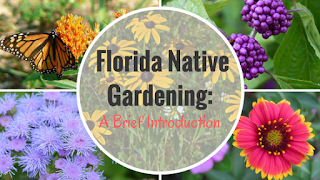 Check out the Florida NativePlant Society for a great database that is arranged by county. You can even find some awesome plant nurseries that specialize in Florida Natives and Florida-Friendly plants. Companion planting is a great way to help your garden succeed. It does mean that you're going to have to do a little more research, but it's well worth it! Plants work together in their environment. Some plants enrich the soil. Some plants ward off pests. Some plants provide shade or height that other plants can take advantage of. Either way, companion planting is the way to go. Other plants aren't the only friends your garden might enjoy. Beneficial insects can help your garden remain free of pests. Butterflies and birds can help make your garden more beautiful. You might want to help the declining bee population in your area. Certain other animals may help keep your home free of unwanted pests as well. Whatever the reason, you may want to figure out which plants attract beneficial insects and animals to your garden. If you decide that gardening is the hobby for you, or you want to start your own little farm, there are so many resources out there to find. A good basic gardening introduction can be found at Jen Reviews. I encourage everyone to try their hand at growing at least one plant. Who knows, you may even get hooked? I hope these tips prove to be helpful. Feel free to ask questions or comment below! I also enjoy seeing pictures of your amazing gardens! Thank you so much! I'm glad you enjoyed the post. This is an inspiring post and I love that fact that you decided to create awareness about the protection of plants in such an amazing way. Hope you get a lot of reads on this post. Thank you! So much is written about so many other natural areas, Florida can be a bit interesting to find. I don't know much, but I hope I am helping people understand a little more about my native State.